A brand domain is the part of a domain between the subdomain and the top-level domain. In www.hubspot.com, the brand domain is hubspot. You can host content on subdomains or suffixes of your brand domain, like: www.hubspot.co.uk or blog.hubspot.com. 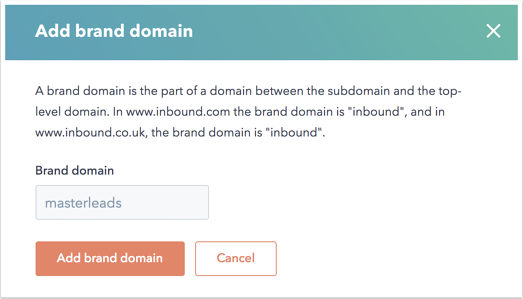 If you're a Marketing Hub Enterprise user managing content or analytics for multiple brands in HubSpot, the brand domain add-on might be a good fit. With the add-on, you can connect subdomains and suffixes for an additional brand in your domain manager. Please note: for current HubSpot customers, any brand domains connected in your HubSpot account on November 1, 2018 will receive all brand domains functionality. A brand domain is considered connected once you’ve updated your DNS records to point to HubSpot, and it appears as connected in either the primary or secondary section of your domain manager. You can host content, create custom analytics views, and set up content access and publishing permissions for your brand domain based on your product subscription. Marketing Hub Basic accounts can host content on one subdomain for one brand domain. Marketing Hub Professional accounts can host content on one subdomain per content tool (Blog, Email, Landing Pages) for one brand domain. Marketing Hub Enterprise accounts can host content on unlimited subdomains for one brand domain. With the brand domain add-on, you can connect unlimited subdomains for an additional brand domain. HubSpot CMS accounts can host content on one subdomain per content tool (Blog, Landing Pages, Website Pages) for one brand domain. Marketing Hub Professional and Enterprise users can create custom analytics views to filter website traffic by subdomain, session country, and URL structure. Enterprise users with a brand domain add-on can create more filtered views segmented by brand domain. Marketing Hub Enterprise users managing global teams, multiple product lines, or multiple brands can create streamlined workspaces by assigning content access and subdomain publishing permissions to their teams. If you're managing content or reporting for more than one brand in your Marketing Hub Enterprise account, you can host content on an additional brand domain with the brand domain add-on. Please note: if you only want to change your brand domain, connect your new brand domain as a redirect domain in your domain manager, then replace your brand domain. On the left sidebar, navigate to Domains and URLs. At the bottom of your domain manager tool, click to expand your Advanced options. Click Upgrade today, then click Talk to sales to upgrade your subscription. After you've purchased the add-on, you'll see the Add brand domain button in your Advanced options. Enter the name of your brand domain, then click Add brand domain. After adding your new brand domain, you'll be able to connect any subdomain for this brand domain as a primary or secondary domain for your content tools.